Have you ever wondered why the need to detox? Why would one need to change so much about who they’re being to completely eradicate the habits and the patterns, the build up, the toxicity that they have run and accumulated? Why is this need seeming so prevalent for people? Change is not desirable to the inner feelings of so many. We want to stay as we are in comfort, yet change to be something even better. How is one to navigate the myriad of suggestions of detoxing to know what is best? The spiritual detox is not about changing in a way that’s uncomfortable, that’s hard, that’s misaligned or un-pleasurable. Spirit Detox is a coming into a joyful place. It stems from a realization that we already have every aspect of ourselves needed to be perfection. The detox is not effort that hurts. It is allowing that nature to burble forth. So how do we detox spiritually? We release. Allow your awareness to move to that central area within you that connects to the feeling sense of being. The area your awareness turns to when searching your spirit for its knowing. Reside your focus in this space until your senses feel calm. (This may take some time.) As your awareness settles here, allow a releasing of holding of ideas, constructs, and any other form of mandating anything to be any particular way. Freeing yourself from constructs enables there to be more space in your essence. More space for your essence. You will each feel or notice something different when you practice this letting go of form and structure. For some the challenge may bring about painful feeling, and for others a sense of enormous freedom, and many other possibilities. The length of time you hold this for is of your own determination. You are simply releasing and giving space to be. So much change is able to occur in this essence of non-efforting. As you let go of need, to follow this practice, you detox, in essence, your life form from vibrational toxicity. Otherwise stated as constructed patterns of believing. Be bare witness while in this detox state and see the mastery of the creative process. Come then into this knowing of how your focus, the attention you give, powers so much of what you perceive in your world, in your life. Spend time each day in this detox state and your desire to create the challenging aspects will shift. You have the ability to release more than you could ever imagine possible at this moment, and to bridge the distance to your soul that you have been feeling insurmountable. So dear ones, spend moments detoxing your spirit and you will find your life changing without paining. We know this may feel too much of a challenge for many to try at this time. So we recommend coming back to this when you sense your changing, your desire to be otherwise, coming to the surface. 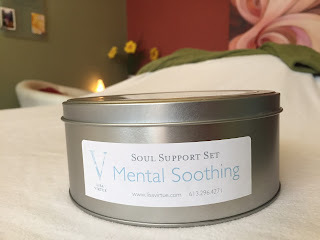 To honour the gift of the Angel of Inner Manifestation and its intention to help us in our ascension process, Mental Soothing Soul Support Sets are on sale for the month of March. This crystal set was channeled by the angels to soothe so much more than just the mind. Harmony inside and out manifests more readily with this set. Find that inner stillness with these beautiful crystal helpers. Contact Lisa to get the set that is perfect for you.